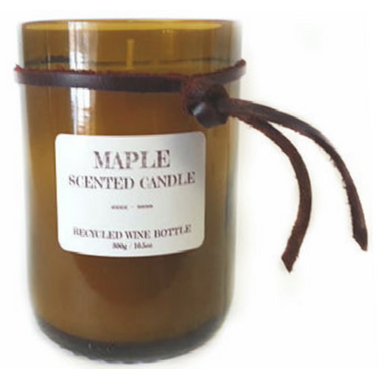 Seracon Maple Recycled Wine Bottle Candle features an all natural, Paraben free, Phthalates free, organic soy wax blend, with the intoxicating, mouth-watering and comforting sweet scent of maple syrup. The wick burns quite blank and billows out smoke. I even trimmed it very small and it still seems to let off black smoke when it's burning. I can't find any listing of what the wick is made up but it doesn't seem like it's hemp or anything clean burning. I like the idea of this candle in the recycled wine bottle and we have another Seracon candle that smells amazing whenever you walk by it. This particular candle doesn't smell as strongly which is why I only gave 3 stars. I need a candle for the bathroom and this one just isn't as strong as some other candles that I have tried. Nice smell! Haven't use this one yet but love the small one!